Horsetail, Marshmallow roots, Amla, Brahmi and Bhringaraj. 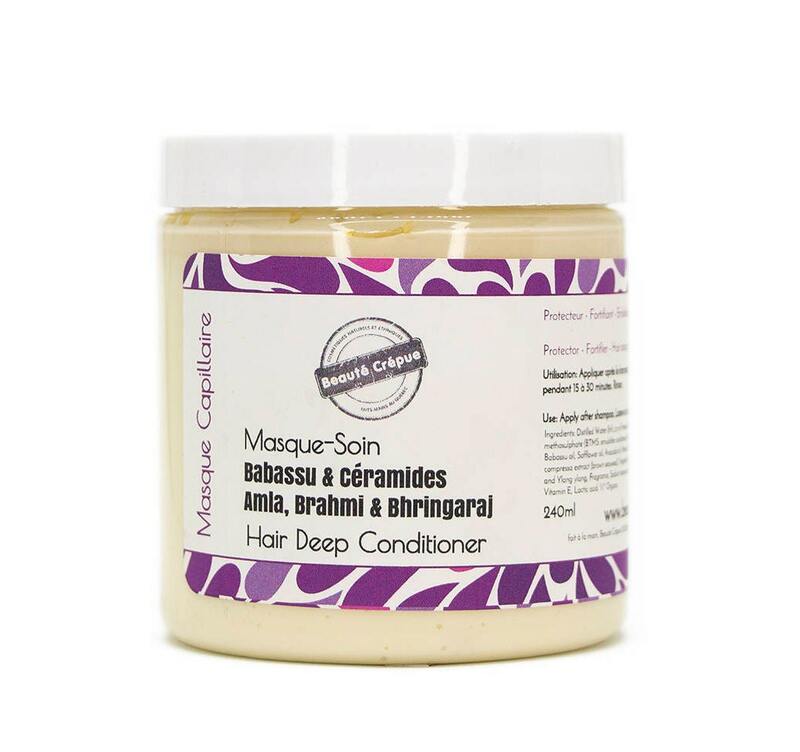 It moisturises, strengthens, nourishes and protects the hair from root to tip. It brings softness and shine to all hair types especially afro, coily, frizzy and curly. This mask is essential for damaged hair, and is recommended for all hair! Use it after the shampooing. It is very concentred. A very small quantity is enough for the hair. This makes the jar last a long time. - Organic Marshmallow Root (infusion): is a natural moisturizer for the hair and scalp. Marshmallow root contains mucilage in abundance, which makes it easy to untangle thick, curly hair. In addition, it contains vegetable protein, vitamins and minerals that nourish the scalp and allow healthy and shiny hair growth. - Organic Horsetail (infusion): A concentrate of vegetable silicium, Horsetail is used to strengthen hair and stimulate growth. Horsetail is stimulating: it tones the scalp activating blood circulation and promotes hair growth. It is rich in vegetable silica, known to strengthen hair. - Organic Brahmi (macerate Olive oil): Tonic, it promotes hair growth, while the thickening and making them shiny. It soothes the scalp and helps fight against dandruff. - Organic Bhringaraj (macerate Olive oil): Bhringaraj is the "hair's plant" in Ayurveda and helps fight against hair loss, baldness and premature gray hair. It helps to keep hair very black and dense. - Safflower Oil: it is a ceramide oil. It is very rich in polyunsaturated essential fatty acids. It protects the hair from free radicals responsible for aging. It nourishes the hair and protects it from dehydration. This oil is known to stimulate hair growth. It sheath the hair and retains water in the hair fiber. - Wheat Germ Oil: it is also a ceramide oil. It is very rich in polyunsaturated essential fatty acids. 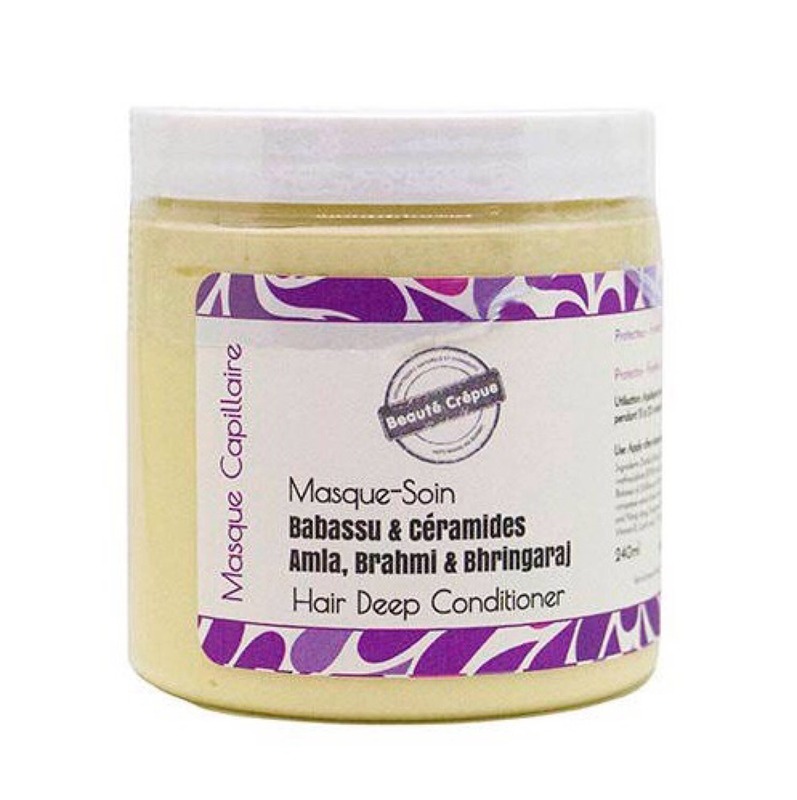 It nourishes dry hair and strengthens brittle hair. - Jojoba Oil: Restores vitality to dry, brittle hair. Eliminates hair loss. Beautifies and enhances the shine and flexibility of the hair. - Avocado Oil: exceptionally nourishing oil acting on dry hair, split ends and damaged. Stimulates hair growth. - Shea Butter: nourishes, protects and makes soft hair. - Honeyquat: Derived to honey, it moisturize and revitalizes hair active. It improves the texture and shine of hair and facilitates disentangling. - Cystoseira compressa extract (a brown seaweed) is embellishing and thermal protector. It brings shine and softness to the hair and protects them from dehydration and aggressions of hair straighteners, hairdryer and sun. - Organic Ylang ylang essential oil: Restores shine and vitality to dry, damaged hair. It is also very effective for care of colored hair. - Pink Grapefruit essential oil: is stimulating and invigorating. It fights against hair loss. - Bay Saint Thomas essential oil: Slow hair loss. Encourages growth and limit dandruff. - The pH is carefully adjusted to suit the hair fiber. Ingredients: Infusion of Horsetail * and Marshmallow* root, macerate of Amla, Brahmi* and Bhringaraj* (in Olive oil), BTMS, Babassu Oil, Safflower Oil, Avocado Oil, Wheat germ Oil, Shea Butter, Jojoba Oil, Honeyquat, Ceramides, Cystoseira compressa extract, Fragrance, Essential Oils of pink Grapefruit, Ylang ylang and Bay St. Thomas, Vitamin E, Lactic acid.